Quick study: Joey Foresta burst onto the scene this past spring by placing second in the Pro Men’s Dual Slalom at the Sea Otter, widely considered the tough- est such race on the planet. For anyone competing against the world’s top riders, that was quite an accomplishment. For a 14-year-old kid, it was phenomenal. If you don’t recognize the name Joey Foresta, don’t worry. We had never heard of him prior to the Sea Otter Classic earlier this year. By the time that race was over, though, we had a feeling we’d be hearing about him for the next 10 years or more. Joey was only 14 years old when he showed up at the Sea Otter this past spring, but he decided to race in the pro men’s division in dual slalom at the event. That’s unusual in itself. Sea Otter’s dual-slalom race is widely regarded as the most prestigious in the world. It’s been that way ever since dual-slalom racing was dropped from the UCI World Championships at the end of 2001, when Brian Lopes won the title. According to the Sea Otter’s rules, riders with a “racing age” of 15 can enter the dual-slalom event’s Pro class, which means that any rider who turns 15 before the end of the year qualifies. That’s how Joey qualified, even though he was technically only 14. Well, to make a long story short, Joey made it all the way to the final round of the event, knocking out one top pro after another. Joey finally lost in the finals to his GT teammate, Martin Maes of Europe, who had won the event in 2015. It was a close match-up between them, and Joey lost narrowly. Three months later Joey finished third in dual slalom in the men’s Pro class at the U.S. National Championships. Clearly, the kid is fast. He won his age- group national championship in dual slalom three times back when he was still racing as an amateur. He also won his age-group national championship in downhill this past summer. What’s more, he won that title for the fifth time. You know a rider’s good when he’s won eight national champion- ships before his 15th birthday. Joey won’t be able to race pro downhill until he gets a little older, but we expect he’ll be doing that soon. When we checked his downhill race time at the USA Cycling National Championships at Mammoth Mountain this past July, Joey’s speed would have put him roughly mid-pack among the nation’s top pros—not too shabby for a 14-year-old kid. How did Joey get so fast? Well, for one thing, he grew up riding mountain bikes in his home state of Utah with pro racers Mitch Ropelato and Cody Kelley—two of the fastest dual-slalom and downhill pros in America. There’s one other thing: Joey’s sister was recently honored as the top amateur BMX rider in America, and she has even been written up by Sports Illustrated. 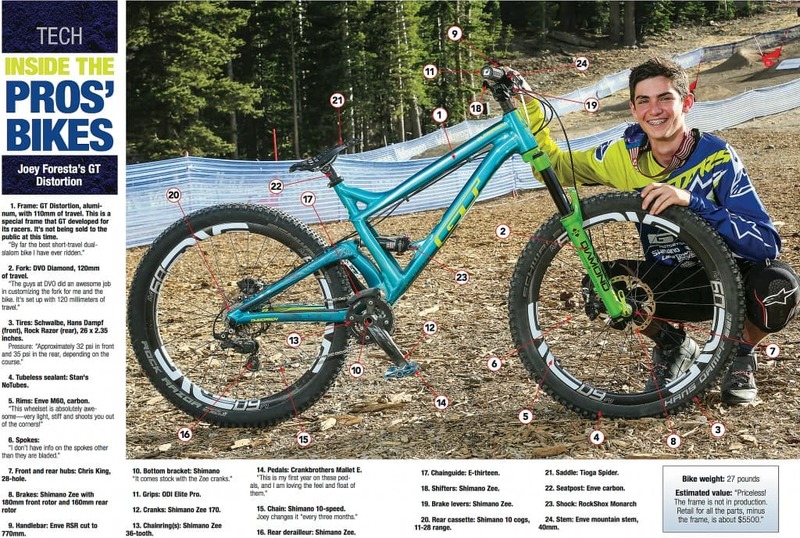 Will Joey win races in the pro ranks in down- hill and dual slalom in the next few years? Frankly, we’d be surprised if he didn’t. The kid is fast: Foresta (right) beat World Cup downhill star Marcelo Gutierrez in their matchup in Whistler’s Giant Dual Slalom, two weeks before Joey turned 15. Joey: My dad is an operations director and my mom manages a staffing company. Joey: Three years old. MBA: Who taught you? MBA: Did you race other bikes before mountain bikes? Joey: I raced BMX since I was 4 and still do a little in the winter for off-season training. MBA: How did you finish in your first race? Joey: I have been lucky enough to win some titles since I started. I won national championships three times in dual slalom and five times for downhill. I also have six Sea Otter wins and six Utah state championship wins. Joey: I got second at Sea Otter in dual slalom and third at the national championships this year. MBA: Are you going to go to college? Joey: Not yet, but I plan to. Joey: [Laughing] I’m not very good at any other sport. My dad says I can’t even catch a cold! MBA: Can you tell us something interesting or unusual about your family? Joey: Neither of my parents are into any type of cycling, and yet my sister and I have excelled at it. She is currently the number-one amateur BMX girl in the country.